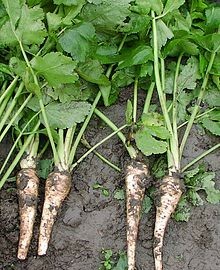 Parsnips are a root vegetable.that are related to parsley and carrots. It is a biennial vegetable that is grown as an annual. Its long tuberous root has cream-colored skin and flesh and can be left in the ground when mature as it becomes sweeter in flavor after winter frosts. The parsnip is native to Eurasia. It was introduced into the United States in the nineteenth century. So can rabbits eat parsnips at all? As you can see parsnips contain quite a lot of phosphorus, a hint of sodium, are very acidic, a little fat and sugar. This means that rabbits can have a small amount of them once a week at the most, but nothing more than that due to their acidic nature. Can Rabbits eat Parsnip Greens? Yes they can eat parsnip greens, they will enjoy them as well. Can Rabbits eat Parsnip peelings?